Cyst of the calcaneus - a disease that is characterized by the appearance of the cavity in the bone tissue. Most often it develops without obvious clinical symptoms. Usually, when the cyst of the calcaneus turn to when there is pain when walking. Main method of treatment of cysts of the calcaneus is surgery, which is carried out curettage (scraping) of the cavity and its filling with a special material. In very rare cases, the cyst requires perforation (drilling) of the bone or Subtotal resection with subsequent washing of the cavity and filling special holocaustum material. Indications for surgery for the cyst of the calcaneus are the obvious radiographic signs that indicate aggressive course of the disease, steady progression of the cysts, the risk of pathologic fracture, confirmed by x-rays, the large size of the cyst, limiting motor activity. The use of modern biocomposite materials in surgery allows not only to remove pain, but to fully restore musculoskeletal function of the lower limb. Before the operation, determine the possibility of access to the damaged area, study the following clinical symptoms: the duration of the disease, the nature of conservative treatment, the volume of surrounding soft tissues, the cardiovascular system and the skin of the foot in the area of the proposed resection, the severity of mobility impairments, the level of blood clotting. Identifies risks postoperative immobilization, the risk of thrombosis. The operation is performed under local anesthesia or under General anesthesia depending on the indications. 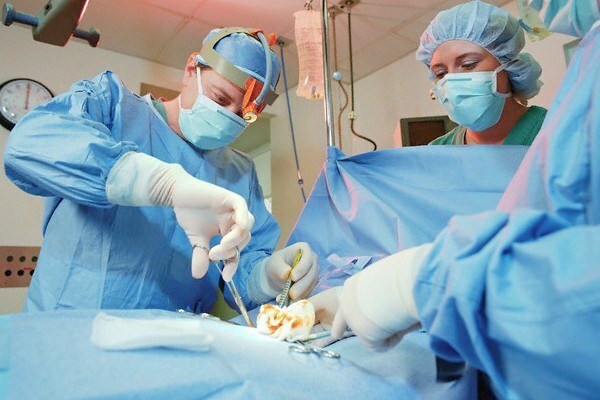 The methods of surgical access include: external, internal. For external access tissue dissected until the periosteum. In this case, there is a risk of damage curralinho nerve, perforating arteries and tendons of the peroneal muscles. Internal access is rarely used in the diagnosis of complications of the cyst - a comminuted pathologic fracture. To the recovery process after surgery is successful, it is important to follow the doctor's recommendations. Within 3-5 days required bed rest, the leg should be kept in the raised position. The joints need to begin to develop as early as possible - on the third day after surgery. The sutures are removed after 10-14 days. For 1.5 months. it is recommended to walk with crutches. Within 2-3 months the necessary dynamic control of the condition of the bone cyst using x-rays. When the cyst is small in size surgery is not indicated, the patient is subject to dynamic monitoring, the possibility of repeated biopsies. In children the heel uncomplicated cyst is treated by conservative methods. If the tumor continues to increase, a month after the treatment it removed surgically. Unfortunately, such an operation is fraught with complications in the form of deformation of bone (projections) post-traumatic nature of flatfoot.